Great wee 3 bedroom cottage close to cafes, restaurants and the great outdoors. Welcome to the Pickled Pigeon Cottage built in 1881 and named after the New Zealand Bird of the Year, the Wood Pigeon. The birds are known to eat red berries which intoxicate them and literally gets them pickled! We have two resident Wood Pigeons who visit regularly in the front of the garden. The cottage is also pet friendly and we are happy to lodge small to medium dogs in the Doghouse , a room attached to the back of the cottage. The backyard is fenced and dogs can roam about freely. The cottage has 3 bedrooms, kitchen, dining room, lounge room, decking , BBQ area and outdoor decking area to have sundowners and view the beautiful garden and scenery. The cottage is an easy 200 metre walk to cafes, restaurants, supermarket, Museum and other shops of interest. Try a tasty chocolate treat from the Lawrence Mint or coffee at 26 on Ross or maybe lunch or dinner at Gabriels Cafe or the Pub. There are lots of things to do in and around Lawrence. It was the first Gold Rush town in New Zealand and walking around Gabriels Gully is a great way to get the sense of history here. There is a great gold course and of course fishing, nature walks and biking the Great Otago Trail is a must. 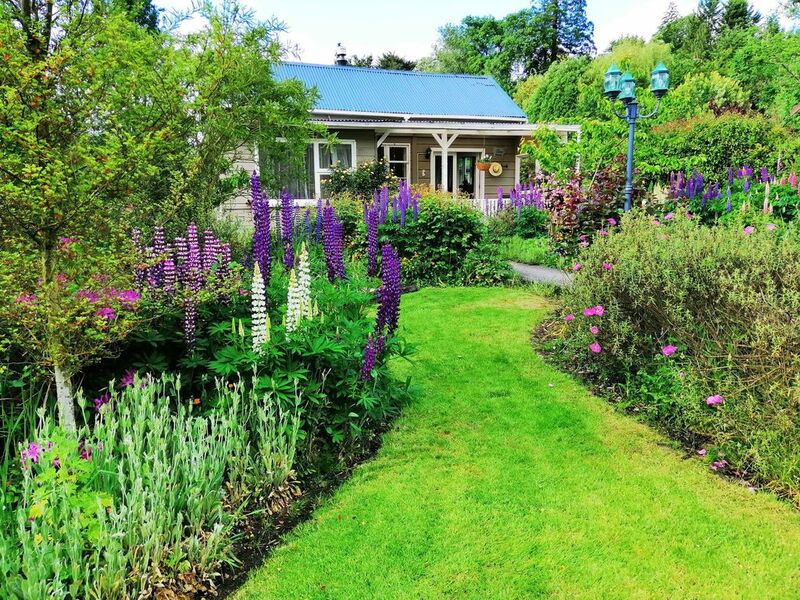 The cottage is ideally located for day trips to Wanaka, Queenstown and the historical township of Clyde. The cottage is 145 dollars a night for two with additional people another 20 dollars. A cleaning fee of 30 dollars is added at the end of your stay. We offer discounts for longer stays of a week and midweek discounts for seniors. toilet, shower, The bathroom also has a washing machine. You are welcome to read any books. YOu can exchange books as well. Try out the local Lawrence Golf Club. Lawrence is an historic gold rush town and a great place to base yourself to explore Otago. days trips to Wanaka, Arrowtown, Queenstown and various wineries. Great nature walks, fishing, golfing and of course the bike trails abound. Thanks for the lovely Easter treats, it was a pleasure to stay in your warm and cosy cottage. Our team were excited with your EXTRA little welcome gifts and were stoked with the accommodation. Thanks so much for providing a comfortable homely place to spend the weekend. Well appointed and the decor and facilities were just perfect. Loved the historical references to Lawrence and NZ. Handy to town for the nice eateries but equally wanted to spend as much time relaxing in the lounge, dining or kitchen area and the weather allowed us to enjoy the peaceful deck and shaded reading spot!! Absolutely loved it and will recommend to friends. Cheers for the treats too! Thrilled you enjoyed staying at the Pickled PIgeon Cottage. Hope to see you again. Loved it from the start,just like being at home. We will be back for more... peaceful, lovely gardens. Everything you need for a relaxing holiday. Didn’ t turn on the tv we enjoyed the silence.Plenty to do or not depending on your desire. lovely property. Quaint and beautifully decorated. Very nice cottage. The weather was beautiful and we enjoyed our stay.